Leigh Kennedy began her career with stories in Analog and Universe, but you might not guess that from this collection. Half the ten short stories here are fantastic, but most share a subtlety whereby the genre aspects are not foregrounded. This more mainstream focus is partly explained by Kennedy assembling Faces initially to submit for a literary prize, and its eventual publication by Jonathan Cape. The title too suggests stories chosen to match a loose theme, as the examples here are more character pieces than straight SF like ‘Helen, Whose Face Launched 24 Conestoga Hovercraft’ which was omitted. Opening story ‘The Silent Cradle’ sets the tone with spare prose sketching a touching domestic story of a woman finding physical signs of a child she has wished for but can’t exist. Little touches, the smell of milk, gentle wear on a teddy bear, school report cards build the child’s life through to adulthood. A child is central to ‘River Baby’ and its sequel ‘The Fisherman’. In the former a young mother’s struggles on her own, in the latter the effect on a childless couple echo each other. Where ‘The Silent Cradle’ was poignant in its affection for Florie, this pair, especially ‘The Fisherman’ are clear headed and unromantic. Significantly, for me, in both cases the essential tragedy is not the event narrated in the story but events from many years earlier and revealed by the story. The past’s emotional power over the present is central to ‘Tuning’ a self-contained excerpt from Kennedy’s second novel Saint Hiroshima, and one of my personal favourites, ‘Max Haunting.’ Within the context of the novel ‘Tuning’ is a powerful redemptive moment, but here that impact is muted. The comic asides lift the reflective melancholy, but in isolation its a weaker story here. The eponymous Max was a figure in the hippie community a decade ago, now he visits old friends and reminisces. At her best, one thing Leigh Kennedy does as well as anyone is to tell a story in the spaces, in the things she leaves out. The format of both her novels makes this more explicit, but the story of Max ex-lover Jenna is developed here by her absence first. In an interview in 1988 Leigh named Anne Tyler and Eudora Welty amongst her favourite authors, and that light touch hinting at a darker secret is evident here. Then we come to the Science Fiction, post-apocalypse cannibalism in ‘Belling Martha’, a mysterious speaking in tongues in ‘Greek.’ Both are denser stories than most of this collection, and less obviously a fit. ‘Belling Martha’ again leaves out much background, and Martha’s history is largely told in people’s wary, prejudiced response to her. ‘Greek’ is the weakest story here in its writing, being overly, clumsily, hesitant, and yet its conclusion, that there is old magic within us despite our efforts to ‘sweep out the enchantment and curiosity’ is worth telling. ‘Petit Mal’ is the shortest story here, the first person narrative of a young woman who starts having seizures. For her time progresses in abrupt stop-motion, and again this allows Kennedy to reveal her story in tragic fragments. Initially the narrator seems oddly detached, without the panic and fear you might expect as her life stutters and jolts, but at the end, as her distance from events is revealed, it all works horribly, poignantly well. Finally, Leigh Kennedy’s best known story. ‘Her Furry Face’ is a deceptive story of an Orangutan, Annie, who not only learns to communicate by signing but by reading and writing and of Douglas who works with her. Told from Douglas’ point of view, the relationship is close, and becomes too close, with disastrous consequences. Balanced against it are the other relationships on show, Annie with fellow ape Vernon, mating in the first line; and Douglas with his wife Therese, who works with deaf children and resents Annie. ‘Her Furry Face’ makes disturbing reading, the central event is shocking, but it is the development of Annie as a character that makes it work on a deeper level. Throughout Faces, in most, if not all the major stories, men are careless or unobserving of women’s feelings. After an argument: “Douglas knew it was true, but why Therese was so bitter about it, he didn’t understand.” The Fisherman expects comfort as he faces emotions his wife faced and dealt with years before. Max is frustrated that the women he once knew are no longer the same women. Florie, Hannah, Velma all accept magic, the various men all insist on the mundane explanations, self justifications. Faces is long out of print, but worth seeking out as a collection that delicately balances the magical and the quotidian on one hand, whilst calmly exposing the dark impulses tearing at that balance. Mixing SF and non-SF, Leigh Kennedy tells charmingly disturbing stories in the spaces between lives and genres. A new Leigh Kennedy collection, I think entitled Wind Angels, is due from PS Publishing later this year. This review originally appeared on Performative Utterance. I was first made aware of this novel in some of the online chat surrounding the lack of well-known works of SF by female writers. It was suggested that it is a fine companion to Robert Silverberg’s (excellent, in my opinion) Dying Inside. In Silverberg’s novel, the main character, a telepath, finds that his powers, far from making him a god amongst men, leave him suffering the same problems as the ungifted and, indeed, are often a hindrance to him feeling fulfilled. Similarly, Nicholas Dal, the writer of the journal of the title is not actually telepathic, but rather a telempath. This power gives him the unwanted ability to feel what those around him are feeling and makes his life incredibly difficult as he struggles to form and maintain relationships. His power makes him too sensitive to the inner feelings of those around him. The problems that this ability brings are highlighted through his damaged relationship with his mother. His father also gifted, shared his Miranda his wife, with the young Nicholas, leading him to struggle with sexual relationships with women. It had been suggested by a psychiatrist that the young Dal had an Oedipal complex, but he and we know that the problem runs deeper than this. His confused feelings here aren’t as a result of any great desire for his mother, rather that his relationship with her was tainted by his father’s love for her and the intensity of the feelings that he had. This is a particularly intense demonstration of the problems faced by Nicholas, due to his family curse. This leads Nicholas to drink vodka to excess. Nicholas is the son of a Russian emigré family, but the drinking of vodka isn’t in any odd hat tip to the country of his forbears, rather it just allows him to blot out any unwanted thoughts that may be broadcasting his way. Much like Silverberg’s novel, though it is made pretty clear that the ability to feel what other people are feeling is not desirable, it doesn’t take this conceit and make Dal’s life an unrelenting grind. Though one would imagine to him that it may feel like that! At some points, Kennedy shows the real highs that he is able to reach through his ability. This is never more obvious than at the point where he meets Jack. She is a fellow student on the course that Nicholas is attending. In the best possible circumstances, falling in love with anyone is a dangerous thing for Nicholas. Not least with the baggage that he brings to the relationship himself. But Jack (not, as he’d thought, Jacqueline, but Susanna) has problems of her own; it transpires that her mother is terminally ill and that her father’s inability to deal with it properly is leading to the break up of her family. Despite the emotional difficulties that Jack brings to her relationship with Nicholas which she can’t know quite how badly they’ll affect him, her time spent with him provides some of the most affecting an intense passages of the book. This is because his empathic abilities allow him to give himself to her completely and in the way that she desires. This doesn’t, of course, suddenly make his life perfect. He still has to contend with the problems wrought by his dubious gift and though he does quickly gain Jack’s heart it doesn’t always seem that he is properly opening up to her. Dal’s problems don’t stop here. 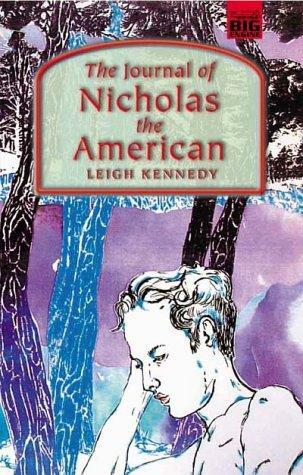 The title of the novel The Journal of Nicholas the American points to a further problem that he has. Though he is indeed an American. He was born there and speaks fluent English – naturally – he still seems an outsider to many. This is without them realising that the barriers that he erects, the obvious drinking and his more personal decision to have a vasectomy and end the line, because the tendency of his family to speak Russian at home and (as Jack wrests from him) his thinking in Russian means that he speaks a heavily accented English and he is identified by his countrymen as being the other. This separation is, of course, what he desires, but it is still an intensely lonely way for him to live. Always preying on his mind is the fear that his ability may come to the notice of scientists and that they will wish to study his ability that someone may use him and profit from him – he is warned by family that he may be treated as a freak for the amusement and entertainment of others. The possibility that he may be being tracked down leads him to have a secretive existence and to run away from this problem, rather than confront it. Much of the novel is pretty grim, almost unrelentingly so, in fact. Partly this could be seen as being a product of Kennedy’s decision to use the device of a journal to tell Nicholas Dal’s story. However, despite some of it being uncomfortable to read, I think that this choice has worked for Kennedy. Indeed, the fact that some of it is uncomfortable is a testament to her ability as a writer. Some may complain that all this heartache, deception and introversion leads to a thoroughly selfish and self-pitying character who makes choices for stupid reasons. Well, he is. But then, really, who isn’t sometimes? Though Kennedy is exploring a fictional ability, we are all able through less SFnal or supernatural means, able to empathise with other people and this can often be painful. Everybody has been, at some point in their lives, stupid or selfish even with the best of motivation. As both an excellent piece of SF (though with a light touch) and a good examination of human relationships, I highly recommend this novel to anyone looking for something new to read. This novel deserves a wider audience than it seems that it has had. Wonderful stuff. This review originally appeared on Solar Bridge.